Bilateral trade between Nigeria and Thailand has been described as robust and Nigeria imports one million tonnes of rice, valued at $700m or aboutN106 billion, from the Peoples Republic of Thailand every year. This was disclosed by Prasit Damrongshitama, the Chief Executive Officer of Chareon Pokphand, CP, Group of Thailand, who led a team of Thai businessmen on a courtesy visit to the office of the Executive Secretary of Nigerian Investment Promotion Council (NIPC) on Thursday in Abuja. He said the investors are in Nigeria to explore possible investment opportunities in the nation's agriculture sector, saying that trade volume between Nigeria and Thailand is now valued at $800m or about N180billion. He said the group is promoted by Thailand's Board of Investment and is a leader in the premium rice sector in processing and packaging high quality rice for the domestic and overseas markets. The company's rice processing plants according to him are capable of producing 360,000 tonnes a year. He said Nigeria is the second largest importer of Thai rice in Africa and is qualified for further investment. "Every year Nigeria imports one million metric tonnes of rice from Thailand which is about $700million. We import oil and gas from Nigeria, and last year it was put at $10 million for oil and $20million for gas. The total trade volume between us is $800milion." He added that Nigeria's economy has improved and is better than that of Thailand projected to grow up to four per cent this year. Nigeria's current economic growth index is six per cent. Mr. Damrongshitama said the prospects of good economic growth and friendly investment climate necessitated the decision to explore more opportunities for investment in Nigeria, saying the Thai company is considering setting up a seed company in Nigeria to grow rice and maize. The huge population of Nigeria which is almost two times bigger than Thailand, according to him, is a good bait for any prospective investor. 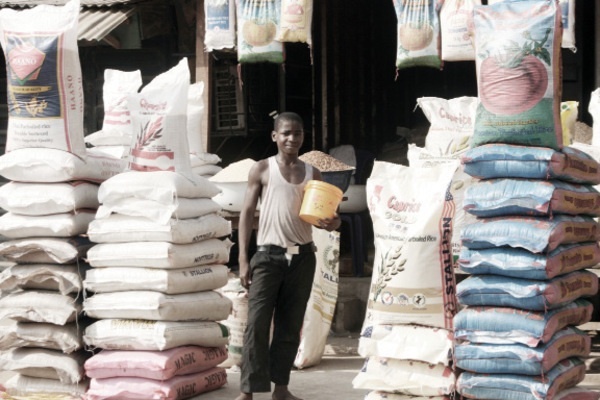 "We want to bring rice to grow in Nigeria. Nigeria's land is good for agriculture like ours. We are good partners and have experience in seed business and looking at potential for tropical seeds production. Nigeria has all it takes," he said. The team interacted with various agencies of government involved in seed production and sales in a bid to have access relevant information, and get samples of Nigerian soil to know which specie of grains to bring into the country, consider the procedure for acquisition of land and registration processes involved in setting up the company. The Executive Director of the Nigeria Seed Company, Olasukanmi Sobowale, told the Thai investors that the country is willing to accept their investment proposals and will allow them bring in their grains for the first four years before they can go into full scale local production. "There are facilities in place for you to establish a Nigerian seed company," he said, adding that plans are underway to review the seed law of Nigeria to further protect all forms of investment. The Executive Secretary of the Nigeria Investment Promotion Council, Mustafa Bello, hinted at the government's plan to adopt sector specific policies to attract investment in all sectors of the economy. This will boost investment since information relevant to every sector will be made available. He said it is a good idea that the Thai group is not only going to grow maize and rice in Nigeria, but will also conduct integrated agricultural research which will be relevant for other investors in the sector. He said expectations are high that with the full execution of Thai's agenda, prices of grain will be reduced in Nigeria. There is so much about this posting that makes one profoundly sad, not simply because I am a smallholder farmer and a leader of smallholder farmers' organisation, USMEFAN - (United Small and Medium scale Farmers' Associations of Nigeria), but because I am a Nigerian. How can anyone who is truly Nigerian and free of crass ignorance, gleefully announce that "the country (meaning Nigeria) is happy to welcome Thai Investments in the domain of maize and rice growing" when our local farmers have proved beyond any reasonable doubt that they are themselves masters and mistresses in rice and maize production? These local farmers have been prepared to suffer all sorts of indignities, including narrowing themselves to so-called commodities associations like the rice growers association, etc. They have made innumerable presentations to successive governments, through their own leaders, who share a large part of the blame for their being neglected and abused by rulers, to no avail. They have endured, without giving in to violent protest, deception and denial of rights. Yet, they continue to produce, rice and all other staples to meet 80% of citizens' food needs. How can an official linked with the agricultural sector accept that Thais can bring their grains in for four more years and then have the option of going into full scale grains production" - on land that our own farmers often have no access to? How can our governments provide foreign farmers necessary support of all kinds that they have consistently denied their own farmers? It is under such a condition of exceptionally bad governance that our farmers, both rice and other crops, must keep the citizens fed and serious food insecurity avoided in the nation. It is even more devastating and self-destructive for a nation to abandon to foreign agribusiness or any other agency, the task of determining and directing agricultural research in quest of an illusory foreign investment. Clearly, farmers' leaders have a large task on their hands to help direct the energies of smallholder farmers, away from merely pleading and 'begging' governments, towards non-violent but firm and compelling protest campaigns for farmers' rights, not for subsidies.